Home Guest Blogger #1 How Would You Play the Hand? #1 How Would You Play the Hand? This is a hand that I played in a juicy 1/3 No Limit Holdem game held at The Limelight Cardroom in downtown Sacramento where things got tricky playing A♣K♣ from out of position. Keep in mind that the way I chose to play the hand does not mean it is necessarily the most optimal way of playing the hand. The game was 8 handed, and I have suited A♣K♣. Villains 1 and 2 are players that I had no previous history with and seemed to be playing straight forward. Villain 3 was a weak player who always short buys, and Villain 4 was a loose aggressive (LAG) player who has a tendency to over play hands. Villain 1 started the action with a pre-flop raise to $15 with Villain 2, Villain 3, and Villain 4 all calling behind. The pot has $64 in it. How Would You Play the Hand here? I decided to raise the pot to $63, leaving me with $157 behind. There is a good chance that I will be able to take down the $60 pot without seeing a flop. It is very unlikely that Villain 4, who has the deepest stack and poses the biggest threat to me, has a big pair because he would have certainly put in a large raise with three players already in the pot. As long as we can get Villain 1 to fold here, we should be ahead of the other three player’s ranges. Shoving all in in this spot is also an option because it gives you a better chance at isolating the shorter stack into a heads up spot. Since my raise pre-flop almost commits me to the pot and A♣K♣ doesn’t play well in a multi-way pot, it is generally better to play it heads up rather than against 4. Villain 1 folded as I was hoping, but to my surprise, Villain 2 calls, Villain 3 goes all in for less ($55), and Villain 4 also calls! The flop is [2♦, 9♦, 4♥]. The pot is now sitting at $255 and I have $157 behind. How Would You Play the Hand here? I decided to go all in for $157. 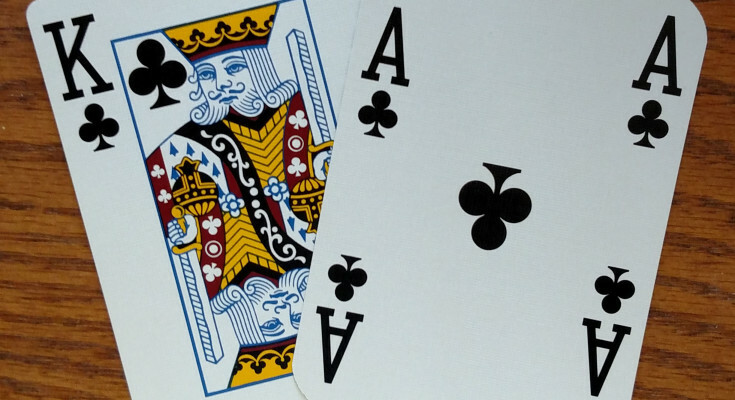 Although I missed completely, Shoving gives me a bit of fold equity, and even if I get called by the larger stack, who likely has a middle pair, I would be getting better than 2:1 on my money with approximately 30% odds to win with my two over cards versus a made pair. Additionally, if my shove gets a fold from Villains 2 and 4, I would be heads up for the pot versus Villain 3 who has already gone all in, and I would only be $63 invested for a $255 pot! If the effective stacks were deeper, a check/fold would likely be the best play. Given the circumstances, checking here seems weak and so does betting anything less than all-in. Villain 2 calls my all in for less ($107) and Villain 4 folds. The board finishes [2♦, 9♦, 4♥, 6♦, A♠]. Villain 2 shows Q♠Q♥ and Villain 3 shows J♠8♠. I won the $463 pot with top pair, top kicker.